The series stars Kevin Corrigan & Natasha Leggero and features guest-stars: Lorraine Bracco, Adrien Brody, Michael Rapaport and Criss Angel. 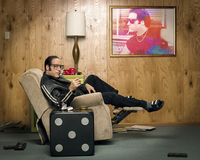 Created by Scot Armstrong (Old School, The Hangover Part II), DICE chronicles life in the Vegas suburbs, as Andrew Dice Clay tries to live his life while trapped in the skin of “The Diceman.” Whether he’s attempting to pay back his gambling debts, manage his sons’ heavy metal band or fend off pumped up fans, this show shines a light on the sides of Dice we’ve never seen before. Yet all the while he dons his trademark black leather jacket and fingerless gloves, ready for a comeback. For more information about DICE, visit SHO.com, follow on Twitter and Facebook, and join the conversation using #SHODice.